About four years ago, I taught myself how to foundation paper piece (FPP). It was confusing, frustrating, and challenging. I had only just begun to learn quilting, and I was eager to learn every technique I could. I made Badskirt's Sew Out Loud block for my friend Katy (@imagingermonkey on all the various social media stuffs) with the words "slave to the needle" embroidered on it. If you know Katy, you would totally know how perfect that was for her! Anyway, even though it was an entirely maddening experience, I was completely hooked and began to FPP every chance I got. One of my favorite FPP designers, Juliet van der Heijden, has recently written a delightful and charming new book called Animal Quilts. 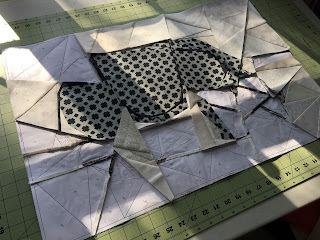 In it are 12 animal FPP patterns, instructions and helpful hints so that even the very beginner can handle stitching up a stunning new quilt. I was thrilled to be asked to join the blog hop for this book, but not so thrilled that I had to choose just one pattern to feature. I wanted to do them all, but time wouldn't allow it. SIGH! They are all so unique and gorgeous! The monarch butterfly on the cover immediately jumped out at me, but I thought that it would probably be done a few times, so I flipped through the pages again, trying to decide which one to sew, which one would challenge me, which one would be unique. I LOVED the highland cow, but eventually decided to do the rhino pattern. He was everything I dreamed of: challenging, unique, quirky, and charming. I started working on him at Aurifil's demo table at Quilt Festival in Houston. Lots of people stopped by to watch me work, admire the book, learn, ask questions or exclaim over how tiny the seams were in some of the pieces. Because I was continuously starting and stopping, I wound up making a several mistakes and had to redo five sections. I think it was worth it, though. I love the way it turned out. I am working on a second one right now, it's his eye you see pictured above. When this pair is finished, I will quilt them with a layer of batting and muslin, then turn them into pillows for my dear friend Elizabeth. It's her birthday today and these are exactly perfect for her.